What would be the fate of protein made from D-amino acids after ingestion by humans? There are some natural peptides made of D-amino acids, rather than the L-amino acids normally found in nature. It is now possible to chemically synthesize artificial proteins made of D-amino acids. If such proteins were ingested by individuals, how would they be metabolized and what consequences would they have? One aspect of the basic biochemistry needed to approach this question is the fact that the enzymes that catalyse cellular reactions show various levels of specificity towards their substrates (reactants), including stereo-specificity. This is illustrated below (an ill-favoured thing, but mine own). 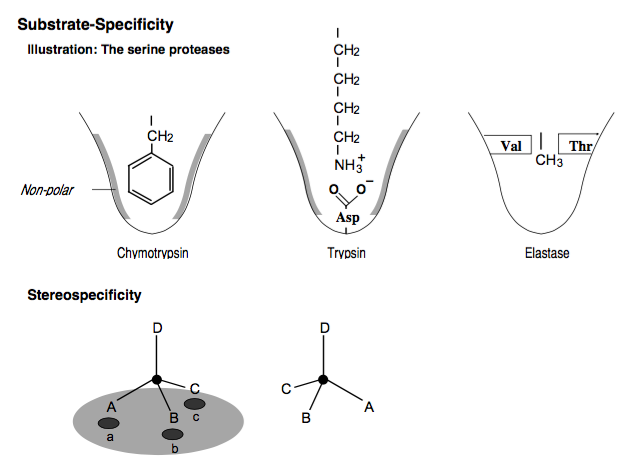 The first example shows that the specificity of proteases may depend on the general chemical or physical nature of the substrate. The second shows the how stereospecificity works. The enzymes that are relevant here are proteases, which are responsible for breaking down proteins to their constituent amino acids, which are then absorbed by the gut, and then the enzymes that would normally catabolize (break down) or metabolize (convert to other compounds) those amino acids. It is well known that the specificity of the enzymes is such that, even if the proteins were broken down to D-amino acids, these could not be used for protein synthesis. A useful consequence of this is that (D)-proteins are highly resistant to degradation and have low immunogenicity (7). The fundamental change in backbone–side-chain connectivity and geometry means they are not recognized as proteins by many (L)-proteins—including proteases. Consequently, (D)-proteins are reported to have greatly increased gut, blood plasma, and intracellular half-lives (8). Better cell penetration has also been reported in some cases (9, 10). Uppalapati M, et al. (2016) A potent D-protein antagonist of VEGF-A is nonimmunogenic, metabolically stable, and longer-circulating in vivo. ACS Chem Biol 11:1058–1065. Rabideau AE, Pentelute BL (2015) A D-amino acid at the N-terminus of a protein abrogates its degradation by the N-end rule pathway. ACS Cent Sci 1:423–430. Nickl CK, et al. (2010) (D)-Amino acid analogues of DT-2 as highly selective and superior inhibitors of cGMP-dependent protein kinase Ialpha. Biochim Biophys Acta 1804:524–532. Brugidou J, Legrand C, Méry J, Rabié A (1995) The retro-inverso form of a homeobox-derived short peptide is rapidly internalised by cultured neurones: A new basis for an efficient intracellular delivery system. Biochem Biophys Res Commun 214:685–693. So it would appear that the D-amino acid proteins are less likely to be metabolized and thus would be less likely to be useful as food. I do not understand why they would have low immunogenicity, but if this is the case it seems unlikely that they would cause allergic reactions. Not the answer you're looking for? Browse other questions tagged human-biology biochemistry molecular-biology amino-acids chirality or ask your own question. Can the sulphur content of biological material be reliably calculated from fat, fibre and protein contents (Weender Analysis)?